Last year, I had the honor of attending Police Week in D.C. along with other members of the Phoenix Police Department. We went to support the widow and family of Phoenix Police Officer David Glasser who was killed in the line of duty on May 19, 2016. Although it was an extremely somber experience, I have never been more proud of our profession. The support, remembrance, honor, dedication, and reverence that were given to the fallen and their families was truly humbling. The nation will mark National Peace Officers Memorial Day on May 15, 2018, and recognize the law enforcement personnel who lost their lives protecting communities. This year, the Candlelight Vigil and Memorial Service will honor 199 individuals. 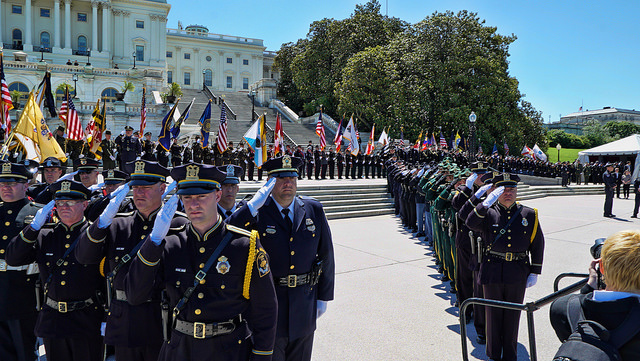 National Peace Officers’ Memorial Day is the focus of Police Week, but the schedule is full of activities and events that celebrate and honor our nation’s law enforcement personnel. The full schedule is available here, but we’ve highlighted some key events below. I look forward to attending Police Week 2018 activities and honoring those who have fallen as well as those who continue to serve. Policing is among the most noble of professions, filled with individuals who put the needs and safety of others before their own. Throughout my police leadership career, one of my most important duties was ensuring our officers had the tools they needed to do their jobs safely. That is the reason I joined the First Responder Network Authority after my retirement from the Phoenix Police Department. I want to ensure officers have access to the best technology, information, and tools to enable them to do their jobs safely. For me and my colleagues at the First Responder Network Authority that is what drives our work during Police Week and every day.